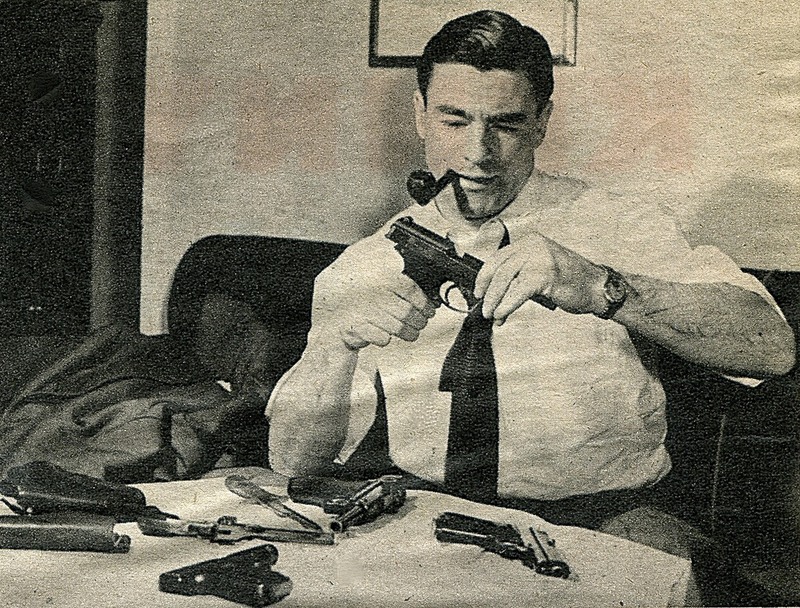 Montreal defenceman Ken Reardon at home with his gun collection, circa 1950. By Wednesday, Tortorella was on the phone apologizing to the Flyers and — well, for the refs, he wanted to wait and do it in person. He did say sorry to the league’s Colin Campbell, too, though that didn’t keep the NHL from fining him $30,000. was what Philadelphia owner Ed Snider was fined in 1999 after his Flyers were eliminated by Toronto in the first round of the playoffs. In the deciding game, referee Terry Gregson called an elbowing penalty on the Flyers’ John LeClair with 2:54 left in what was still a 0-0 game. Toronto scored on the powerplay and that’s all she wrote, until Snider and his coach, Roger Neilson, got in front of the microphones. “The officiating in this league is a disgrace,” Snider told them. “I understand I’m going to get fined, and I don’t care how much. The truth is there.” Neilson said, “To lose it like that, it is unbelievable.” He was fined $25,000. Washington Capitals general manager George McPhee had to pay in the 1999 pre-season for the crime of punching Chicago Blackhawks coach Lorne Molleken in the eye and tearing off a sleeve of his jacket. McPhee didn’t like the Blackhawks rough tactics, apparently. He was also suspended for a month without pay. was the total of fines levied in December of 1963 for what NHL president Clarence Campbell called “the worst donnybrook that the league has experienced in many years.” Chicago and Toronto were teams involved. Chicago’s Reggie Fleming was serving a five-minute major for having speared Eddie Shack when Bobby Baun came after him into the penalty box, after which everybody got into it. Campbell reported that there was no evidence to support the claim that Leafs’ trainer Bob Haggert had punched Chicago’s winger Murray Balfour. was the price Alex Burrows paid for (and I quote) “conduct deemed detrimental to the NHL and the game of hockey.” This was in 2010, after the Vancouver winger took successive minor penalties for diving, interference and unsportsmanlike conduct in a 3-2 Canucks’ loss to Nashville. After the game, Burrows told reporters that referee Stephane Auger had let him know during the warm-up that he was going to get back at Burrows for showing him up in a previous game. “I think he should sit out the rest of the year making calls like that,” Burrows opined. was the fine Clarence Campbell imposed on Montreal coach Toe Blake in 1961, and it was the biggest ever, at the time, in NHL history. During a Stanley Cup semi-final game in Chicago, referee Dalton McArthur called a tripping penalty that Blake liked so little that he felt the need to charge onto the ice and throw a punch at McArthur — “a long, looping right,” according to Sports Illustrated, which missed. Another time, trying to punch another ref (Vern Buffey), Blake’s players held him back, and he had to make do with trying to slug a fan on the way to the dressing room. Missed him, too. Detroit Red Wings’ coach Sid Abel fined his own players in 1959 after they lost their third game in a row, 5-0, to the New York Rangers. It was the worst game Detroit had played in Abel’s 20 years as a player and coach, he said. Fourteen Red Wings were docked $100 each, with Forbes Kennedy and Lou Marcon playing well enough to escape punishment. Norm Ullman was excused, too, having left the game with a bad foot in the first period. Just for good measure, Detroit president Bruce Norris strode into the dressing room after the game and ordered the doors locked so he could berate the players in private. was enough to keep Ken Reardon quiet in 1950. It was a couple years, by then, since New York’s Cal Gardner had cross-checked the Montreal defenceman in the face, but Reardon hadn’t forgotten the 14 stitches he’d needed to sew up his lip. In 1949, after the two swung their sticks at one another, both were suspended for a game and Gardner (he was with Toronto, now) was fined $250 and Reardon $200. That was the set-up for Reardon’s telling a reporter from Sport magazine that he was planning to take his revenge and pay back those 14 stitches. “I may have to wait a long time but I’m patient,” he said. “Even if I have to wait until the last game I ever play, Gardner is going to get it and plenty.” That’s when Campbell stepped in. The $1,000 wasn’t so much a fine, he said, as a bond for good behaviour. At the end of his playing days Reardon could petition the NHL to get his money back — as long as he’d been good. was what it cost in 1951 to grab an NHL referee by the necktie in a hotel lobby. Rocket Richard discovered this when he went after Hugh McLean in New York’s Piccadilly Hotel. He was angry, apparently, about a match penalty McLean had called the night before. Some accounts go with the tie, but others say that Richard grabbed the referee by the throat and attempted to throttle him. was the most any of the 27 Montrealers who were convicted of participating in the 1955 Richard Riot had to pay when they went to court in April of that year; $25 was the least. In 1944, meanwhile, also in the real-life justice system, former Boston defenceman Eddie Shore was fined $100 and costs on two charges of violating U.S. wartime oil control regulations. He was coach and manager of the Buffalo Bisons by this time, pleading guilty to illegally obtaining graded gasoline and having in his possession a gasoline ration book other than the one issued to him. Boston manager Art Ross was fined by the league in 1932 after a game against Toronto in which he threw two punches at Leafs’ defenceman King Clancy, only one of which hit home, with referee Cooper Smeaton absorbing the other. This was also the fine imposed by Clarence Campbell on linesman George Hayes in 1963 after he worked a game unshaven. — in a good cause, I guess.